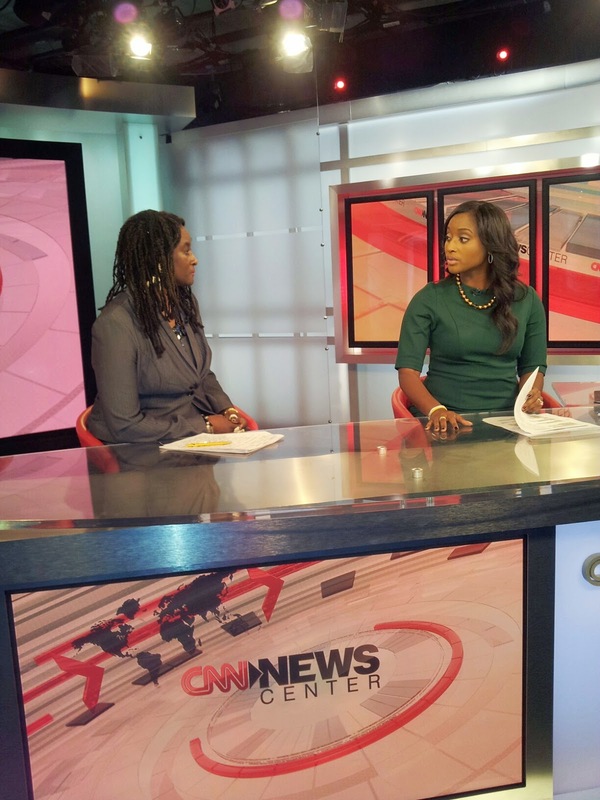 Ambassador Robin Renee Sanders discussing Boko Haram and missing Chibok girls in a November 12, 2014 interview on CNN International with Isha Sesay. Ambassador Robin Renee Sanders, during her November 12-14 book tour in Atlanta, Georgia, to launch "The Legendary Uli Women of Nigeria," she met with Isha Sesay prominent and internationally recognized for reporting excellence, CNN News Center Host Isha Sesay to discuss Boko Haram and the state of play in finding the still missing Chibok Girls. Both Sanders and Sesay emphasized the distressing nature of the continuing tragedy. Sanders key points were the role of human intelligence was crucial in finding the girls, and for traditional standing armies like Nigeria's it was difficult to transition to responding well to asymmetrical ware. Dr. Sanders can also address current event issues happening on the African Continent. There is an upcoming event you don't want to miss; a uniquely awesome Author Talk and Book Signing with Ambassador (Dr.) Robin Renee Sanders, a U.S. Diplomat for 20 years. She will highlight key cultural elements of her book which should be important to all of us as global citizens, particularly seeing African signs and symbols like Uli as information systems. She is also available to discuss current events in Africa given her past and current experiences on the ground on the Continent. See below information on her book. Her full bio is also attached. Sanders will be available for special signings of her hardcover full color coffee table book, which comes in a gift set, following the discussion. She has recently been a subject matter expert on Ebola on MSNBC, Al Jazeera, China TV, Armstrong Williams Show, and TVOne News. Her full bio is attached above. Sanders will be available for special signings of her hardcover full color coffee table book, which comes in a gift tote, following the discussion. Photos of Sanders and Book Cover follows below along with book summary. Ambassador (Dr.) Sanders is CEO of the FEEEDS Advocacy Initiative and owner of FE3DS, LLC, and having lived in Africa for several years, was always struck by the ancestral, socio-historical and educational aspects of certain African cultural practices, especially languages, artifacts, and sign and symbol systems from the Ovahimba in Namibia and Pygmies in Congo, to the Horom, Hausa, Igbo, Yoruba, and Fulani of Nigeria. Her experiences on the Continent made her appreciate each and every culture and "its information systems," which in the end she called "communication expressions." This book follows eight extraordinary Nigerian women in the December phase of their lives as they try to preserve the meanings of their endangered sign, symbol, and motif system called Uli. Uli is an acknowledgement of their Igbo history, culture and ancestors. Sanders that non-text, non-oral forms of communication expressions such as Nigeria's Uli, and other sign and symbol systems throughout the world, particularly in Africa, are just as important or "viable" as the written word and their meanings should be respected and preserved. The Legendary Uli Women of Nigeria is a uniquely groundbreaking work. It does not discuss, or view African signs and symbols as art or designs for contemporary clothes or jewelry, but stresses that they communicate. It also argues that world signs and symbol systems like Uli should be included as an area of study within the communication and information system academic field, which she recommends be called "communication expressions" since these systems do communicate the socio-historical aspects of a culture. During Ambassador Sanders' keynote speech entitled: The Elements of the US-Africa Relationship: Building on the Historic US-Africa Summit focused on how important it is for the United States to further expand the goodwill from the recent of conclave of African Leaders in Washington, D.C. August 4-6, 2014. She highlighted the key elements or build blocks of the relationship, noted the challenges, and also underscored the positives trajectory of many African nations and the Continent writ large, stressing how the U.S. can better engage with this growing politically and economically important region. 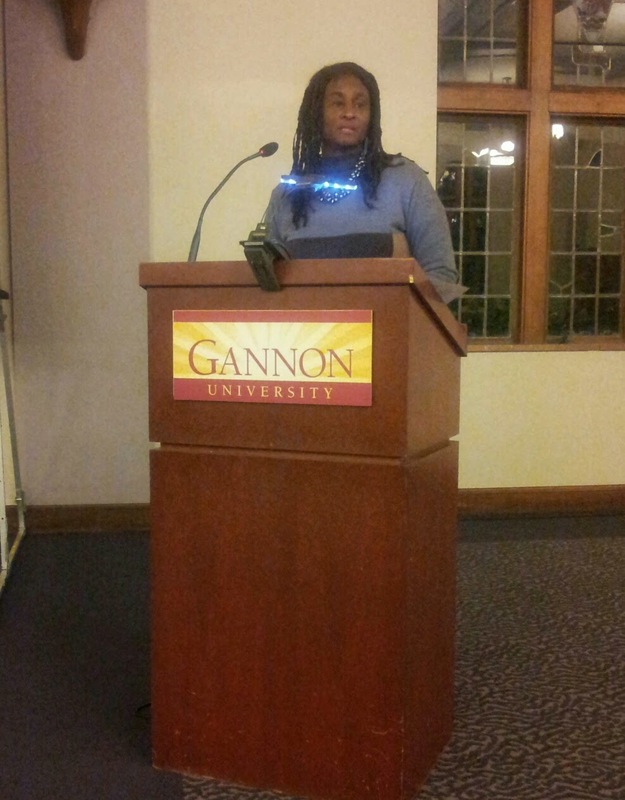 Sanders explained to the audience, which included Gannon University students and faculty, as well as leading members of the wider Erie, Pennsylvania community, that the U.S. needed to ensure that the next generation of young Africans, between the ages of 10 years old and 30, see the U.S. as a partner they can work with; and, a partner that respects the region and its people. Dr. Sanders said that the U.S. has come along way in the last decade in turn the corner with its relationship with Africa, adding that the historic 2014 Summit was designed to have America be more comprehensive and strategic in its approach to the region that it had previously been. Dr. Sanders also met with resettled African refugees from Democratic Republic of the Congo, Liberia, South Sudan, Sierra Leona at the Quality of Life Center run by Director Gary Horton to hear their challenges as their lives transition from refugees-to-immigrants-to-"New Americans." In addition Sanders participated in a career day luncheon with African-American female high school Students in a college preparatory program called Go College. It is said that every decade or so our world creates a new global order – as generations shift, leaderships transform, visions change, and creativity and innovation force us all to live our lives better, longer, differently and certainly with more challenges. Today’s global landscape is much, much different than it was 10 years ago, 5 years ago, or even earlier this year. If you are following the international news today you can see how much the world has changed just this year with the surge of the Islamic State, the annexation of Crimea from Ukraine, and the continuing conflicts in Syria, and Libya. We are living in extraordinary times as world challenges are increasingly more daunting, but equally so are the enormous opportunities to make a positive difference, and further expand positive US relations at a time when a segment of the world views our superpower status as a negative, or a clash of civilizations -- contrary to their socio-political perceptions or extremism. Unfortunately in the last few years some of these issues have manifested themselves into horrible acts of terrorism. However, there are new partners and friends, political and economic, out there for the U.S. to further engage with during these turbulent times and beyond. I would also argue that Africa is one of those world regions. I believe the U.S. leadership is now focusing more on the region in a way that it has never done before – comprehensively and strategically – as was evident this summer by the first-ever U.S. Africa Summit August 4-6. 2014, hosted by a U.S. President, sitting or otherwise. So why is Africa important, you might ask, particularly in the global landscape I just highlighted for you? Who are the New Emerging African Leader Nations? So let’ start with answering these questions – why is this region important, and what does this region mean for and to the United States as a strategic political, economic, or cultural partner. In other words: What are the important elements of a US-Africa relationship? Africa’s population today is reportedly 1.1 billion and it is on course to reach 2.4 billion people by 2050. Its current average yearly growth rate is 2.45 per cent, which might remain constant or even grow higher over the next decades, increasing that 2.4 billion number. The most significant figure, within the population numbers I just cited, is the youth figure (ages 10-30), representing about 50 percent of the region’s population now, and will cross over that 50 per cent mark in the next two decades. These stats will move Africa from the second most populated region in the world to the largest. However, most will remain below the poverty level if current development doesn’t triple since the Millennium Development Goals (MDG’s) will not be met by most countries next year. Here are the reasons I see that make the points I just described and the type of relationship that the U.S. forges with the Continent over the next decade -- increasingly important. Africa is the now the new frontier for these policies, business, emerging markets opportunities, and counter terrorism partnerships. Religious differences or groups that might impact world views, encourage conflicts, affect perceptions of an action or statement, particularly by the U.S. Government. In essence what are the human, regional, or country cultural differences about which we need to be aware and better understand. All of these elements fall under my demographic and geographic umbrella of issues as they affect geo-political and economic relationships, and world views which can be very different from our own. Therefore, since I want to leave the global leaders at Gannon University something to think about -- you as future leaders will have to take these elements into account. And, certainly many others. So what are the next steps? How do we address the elements highlighted above, build on the US-Africa Summit that I mentioned, add new elements, particularly the role of the African Diaspora (1.6 million, U.S. Census 2014 figure for African-born immigrants), in helping to ensure we have a positive relationship with the Continent, particularly since half of the region’s large population will be under the age of 30 ­– prime education; prime wage-earning years; prime years to be influenced as partners. Keep in mind my introductory comments as to the current challenges the U.S. has today with some in this age group in certain parts of the world (and even lately within the United States with the young girls from Colorado, and others from Alabama, Minnesota, North Carolina, United Kingdom and other places being attracted to join groups like the Islamic State, Somalia’s Al Shabaab, or terrorists groups such as AQIM or AQAP). We have to begin to address further why this age group, in some parts of the world, is feeling disenfranchised enough to be attracted to these terrorists groups which also see the U.S. system, its benefits, and our way of life as enemies to how they see the world or their communities. Given that Africa will be the largest populated region in the world, with the largest group of people from ages 10-30 years of age for the foreseeable future, we have to find ways to change this. -- 9-10 - number of countries FEEEDS Initiative counts with terrorism challenges. -- Last but not least, the region has collectively a $50 billion[iii] dollar economy – making it one of the largest potential markets for U.S. goods, services, investment, trade, and business relationships. I have pointed out these positives and challenges because, as the global landscape continues to change rapidly, we need to not only build on existing friendships, but also ensure that the next generation of young Africans sees the U.S. as a friend and a partner even when and if we differ on policy points. So what can the U.S. do to help further build this relationship, this partnership that I am talking about so we have friends that we know, and that know us, in this large population, including expanding our part in their emerging market growth, and assisting those in the Sahel Region in the counter terrorism fight? So What Can the US Do? Think about the strategic long term with these emerging African nations, its leaders, and its people. So How Do We Engage Differently? We must engage differently than we have in the past; we must listen more; understand the human cultural differences; and understand that each country may have its path to solidifying its own democracy; keeping in mind this means they must protect all human rights in the process. The question is how we assist, if asked to help, while also taking care of some of the same issues right here at home. We can seek to share our values and principles without appearing heavy-handed, and unconcerned about the plight that everyday people face with the searing demographics I just mentioned. I do believe that there are global human values that most people hold dear: they want to be able to feed, clothes and house their families; live with dignity and respect for human rights; have access to affordable health care, and education for their children; earn a living wage through job creation or through entrepreneurial expression; provide a voice for the voiceless; encourage free press and good governance within recognized legal and transparent regulatory frameworks; and, a have reduction/elimination in corruption. Although the U.S. Government has improved greatly over the last decade, with programs such as FEED the Future (Food Security), Power Africa (Energy), PEPFAR (HIV/AIDS), MCC (Infrastructure), etc., (all my favorites) we need to continue to move away from providing our tacit support for some governments who are not doing the right thing in taking care of its people. In addition, as we encourage more peaceful, transitions to change from closed to open societies, this may sometimes mean a longer term processes without calling immediately for elections; we tend to think elections solve everything. Elections can only do that if the ground work is stable and strong; longer transitions (with the right democratic elements) may be needed to build a lasting enabling environment. The world is interconnected and what happens elsewhere, I think many Americans now are realizing, can and will eventually affect us. To the Gannon University students here this evening knowing that your intervening college years will provide you with the building blocks to become global leaders, I hope in the midst of your time here integrity, fairness, and respect are also the other take aways. I, however, would like you to add to your list the need for a better appreciation of human and country cultural values (what I have been calling in my lectures -- human cultural communication), and the demographics (many of which I mentioned here tonight and during my week-long lectures) that would go with them. It is a complicated, tough global environment, and players and challenges will constantly change. You will need to understand and try to address these changes without losing the sense of who we are as a nation. We must fight enemies whenever and wherever we can, but not pick fights unnecessarily. This includes being tolerant of others who see the world differently as long as they do not choose to do us harm, and are not committers of horrible human rights acts, and terrorism. We do not always have to agree but in the first order seek ways to work together for the greater good. I would add to that today – to also draw on lessons learned from history in the process. Think smart about the global environment we are in as you will be part of the new global leadership. So, Lead, Inspire, Reach Out, in shaping the new global landscape. I will be counting on you, America’s students today, to do this for our future and for our country’s tomorrow. Thank you.